St. Augustine is a fascinating destination with an array of interactive tours and historic attractions that make our ancient city so special. Allow our blog to help you plan the perfect stay with our favorite picks for upcoming events, art festivals, live musical performances, nearby museums and more. Guests at the TRYP by Wyndham Sebastian St. Augustine will have the opportunity to hear a beautiful selection of seasonal music performed by a real, live orchestra. The EMMA Concert Series will be presenting its annual Holiday Traditions Concert with the talented Gainesville Orchestra on Wednesday, December 19th at 7:30 p.m. at the Lewis Auditorium. Less than a mile from our hotel, you and your family will be delighted by classic and popular holiday tunes at this concert and sing-along event led by Music Director and Conductor Evan Haile. You will find the holiday spirit in sunny Florida, enjoy all of your favorite Christmas songs, and create fantastic memories to share with your family for years to come. 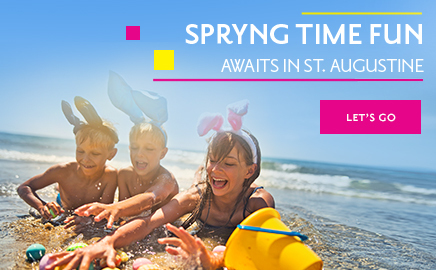 Become a part of this wonderful St. Augustine tradition today by purchasing your tickets online now. Admission for adults is $40 and tickets for children and students (with ID) are only $5.